Did you know that the repair, rebuilding or replacement of an automatic transmission is often more expensive than that of an engine? While everyone knows the importance of an oil change service, few people seem to realize the extreme importance of an Automatic Transmission Service. 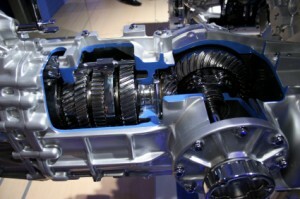 The automatic transmission is a more complex system of moving pieces of metal that mesh together at high speeds. Those pieces of metal have to stay cool and be properly lubricated. If they are not, they can cause a major breakdown that can cost several thousand dollars. So, what should be done to prevent a major automatic transmission repair? A simple, low-cost automatic transmission service at approximately every 24,000 miles. However, the interval is determined by your car manufacturer’s recommendations and you must factor your own driving habits and conditions into that interval. Get your transmission serviced at least every 24,000 miles. An automatic transmission service will remove the current automatic transmission fluid inside and replace it with fresh fluid that will protect your transmission better. Over time, that friction and heat inside of the transmission causes the fluid to lose its protective and lubricating capabilities. As this happens, small pieces of metal join the transmission fluid because of the friction. This dirty transmission fluid can quickly create more problems for your transmission. As a routine, when your car is here for any service we will check to see how the transmission is doing. If the fluid is dirty, we will recommend a service. It’s important to get that done as soon as possible because with each mile, more damage can occur inside and out of your sight. Most transmission problems start out small. They get worse over time. Very often, you can eliminate major repairs simply by taking care of the problem early on. Whether it’s a warning light on the dash, a few drops of fluid on the garage floor, or a change in the way the transmission operates, your best bet is to take your vehicle to Performance Automotive. In many cases you’ll be able to avoid a major repair simply by catching it while it’s still a minor one. You may not realize it, but your car’s cooling system does more than keep the engine running cool: It also cools the transmission fluid, through a heat exchanger built into the radiator tank. So a faulty cooling system cannot only damage your engine; it can reduce transmission life as well. In fact, transmission damage may occur long before the engine overheats. To avoid both engine and transmission problems, keep your car’s cooling system clean and in tip-top condition. The engines and transmissions in today’s cars are linked far more closely than in the past. A problem with engine performance can put much more strain on the transmission than one that’s running properly. That’s another reason why it’s important to keep your car’s engine in good running order. A good running engine reduces the stress on your transmission, so the transmission can last longer without requiring major repairs.